When you work with a Certified Tax Coach, you aren't just getting a tax return at the end of the year. Tha's why each tax return prepared by a CTC comes complete with a tax maintenance program. Tax maintenance programs are designed to give you ready access to a Certified Tax Coach. We're there for you when you need us! This enables you to experience the least amount of tax liability each year and continually evaluate your situation as you work your way toward achieving your goals. Our programs were created to provide consistent, regular coaching to help you set goals and create a plan to achieve them. You have a trusted business advisor to answer any financial questions that may come up. Best of all, we highlight areas in which you are doing well and those that need improvement. You will receive the accountability you need to see your dreams come true! Why should I choose a Certified Tax Coach to assist me with my taxes and financial planning? Are you one of the millions of American taxpayers overpaying the IRS and overlooking deductions year after year? 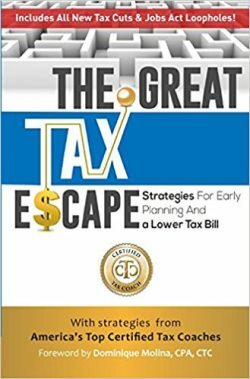 Certified Tax Coach's tax professionals scour the tax code and thoroughly examine each client's income and business options to rescue every deduction, tax advantage, and credit possible. Certified Tax Coach emphasizes year-round proactive planning to ensure that clients can utilize every available loophole and savings opportunity possible.